SPICE simulation of this circuit shows that it easily oscillates when capacitor C is as little as 0.8pF (but the frequency is then about 1.5MHz, and the amplitude is small); increasing the cap to 4.5pF gives a full rail-to-rail oscillation, at around 280kHz, i.e. closer to what is seen in reality. I have attempted to measure the coupling between the traces on the PCB, using the technique detailed here, and I reckon it to be about 1.5pF, which seems to be inside the range for which oscillation is possible (my scope trace for the measurement is here). Also shown is the open loop response derived from the SPICE macro model for the op amp, the blue line, which being more sophisticated than the simple integrator model has more poles in it, which is why, after the turn, it falls more steeply than the green. The undesirable positive feedback resulting from the resistor and the unwanted capacitance adds a pole-zero pair into the transfer function: the combination of values of the cap and resistor are such that the (now) two poles form a complex conjugate pair, i.e. the function is no longer overdamped but underdamped, so we have a resonant peak, which if sufficiently 'peaky' is what causes the circuit to oscillate. The orange trace above shows this behaviour in the integrator-based model; the red line is from the macro model version, showing that the integrator model is perhaps a little too enthusiastic, but it does capture the gross characteristics. Three of the six op amps in the mixer are in this particular circuit configuration, and yet (in mine) only the one was actually oscillating (the main summer in channel A). For the two non-oscillating op amps I supposed this simply to be due to a smaller amount of capacitive coupling from the output back to the non-inverting input: I thus decided to 'up the ante' and soldered a couple of wires, each a few inches long and touching, but insulated from each other, onto the appropriate pins of the chip—this indeed added enough extra capacitance to get both these op amps oscillating as well. 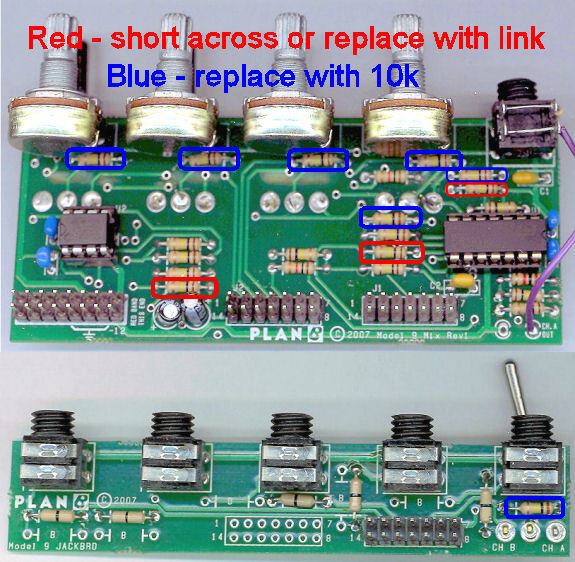 I thus recommend replacing all three indicated (red-circled) 100kΩ resistors with wire links. Bleed-through: if a signal is applied to a particular input channel but not switched through to either the 'A' or 'B' output channels, there may be noticeable 'bleed-through' of the signal to the outputs: the effect is quite variable, dependent on the input channel, and 'Ch. 4' seems to be the worst affected. This is caused by capacitive coupling within the circuit, which then tends to act like a differentiator, and hence the effect is more noticeable at higher frequencies.